The China-India economic relationship is one of the fastest growing in the world: Bilateral trade has grown from virtually zero to $100 billion in just over a decade, and Chinese exports to India grew at 39 per cent a year since 2001. India’s rank as an export destination went up from nineteen to six, for China’s exporters. India’s exports to China didn’t keep the same pace, however, and as a result, the trade today is skewed in China’s favour, by two to one. While India imports consumer and capital goods from China, its exports are mainly primary goods like ores, metals and cotton. This growing imbalance spells ill health and unsustainability for the future of bilateral trade relations. Furthermore the large trade numbers are not matched by any investment flows, in either direction. In two decades, China’s cumulative Foreign Direct Investment (FDI) into India is less than $1 billion, and India’s investment into China is similarly low. There are other signs of occasional friction and trade squabbles. Indian industry is suspicious of below cost dumping by Chinese exporters eager to harness India’s relatively high growth, as the slowdown continued in conventional export markets Europe and North America. As such India has slapped several cases of anti-dumping against China, consistent with the rules of the World Trade Organization (WTO), of which both are members. For its part, China seems to have raised hurdles in the export of pharmaceuticals and IT services, which are India’s forte. Notwithstanding these relatively minor irritants, growth in trade continues strongly. In the past four years, the two countries have held three rounds of high-level Strategic Economic Dialogue discussing issues of trade, investment and economic cooperation in sectors like railways, infrastructure and energy. Against this background, the maiden visit of President Xi Jinping to India this past week was much awaited by both sides. When he came into office last year, he had articulated five proposals to improve Sino-Indian ties. He said that the two countries should maintain strategic communication, harness each other’s comparative advantages, strengthen cultural ties, expand coordination in multilateral fora, and accommodate each other’s core concerns and differences. The last point refers to border disputes, treatment of Tibet’s status and India’s concern about protecting its downstream (river) riparian rights. Nevertheless, Xi’s visit was expected to strengthen trade relations, especially by boosting investment flows into India, as a counter to the growing trade gap. His visit came soon after the visit of Indian Prime Minister Narendra Modi to Japan, which resulted in New Delhi receiving a significant investment commitment from Tokyo. There are many similarities between the two leaders of the two most populous nations in the world. Modi won a historic mandate in May to form a government with an absolute majority in the lower house of India’s parliament. The last time any single party won an absolute majority was 30 years ago. Modi is seen as a nationalist and reformist leader, with a track record of having led a provincial government for three consecutive terms, and someone who is intolerant of corruption. During his tenure as Chief Minister of Gujarat, the state recorded China-like growth rates. Xi too was elevated to the highest office with an implicit mandate to consolidate the diffusion of political power, to re-balance the economy away from investment toward consumption, to reduce social and economic inequality, and most importantly to crack down on corruption. Like Modi, Xi too is seen as a strongman who will wield his power to pursue reform and an anti-corruption agenda. 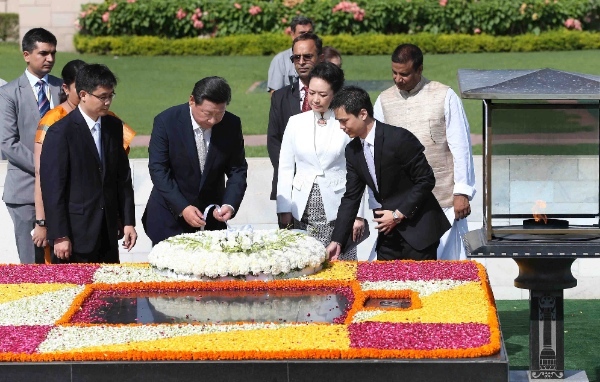 Xi and his wife Peng Liyuan began their visit to India, not from the capital Delhi, but from Ahmedabad, the capital of Modi’s home state. The visit included Xi donning khadi (handspun Indian) clothes and making a trip to Gandhi’s ashram (hermitage). He received a gift of the Hindu Bhagwad Gita epic scripture translated in Chinese, and a Gandhi autobiography. This itself signaled the bonhomie between the two leaders. During the trip, trade ministers from both countries signed a five-year trade and economic development plan – this pact includes a commitment of an investment of $20 billion. This is the first step toward restoring some balance in the trade asymmetry. The investment will include two industrial parks, one dedicated to the power sector and the other to automotive industry. The size of the investment, however, fell short of the $100 billion touted in the lead up to Xi’s visit. But there were 16 other pacts signed of various sizes, including commercial loans from ICBC to Indigo Airlines. There was also an agreement which facilitates market access to Indian pharmaceuticals, handicrafts, textiles, and gems and jewelry. In the detailed formal talks in Delhi, Modi brought up the thorny issue of periodic military incursions. The mention of this, in an otherwise friendly-fest atmosphere, did not vitiate, as much as point to the fact that the mutual relationship had reached a maturity to accommodate such frankness. India and China have much to gain due to complementarity of their investment predicament. China has excess foreign exchange reserves, earning a pittance. Whereas India has a hunger for a trillion dollars of long term funding for infrastructure which can earn a healthy return. The two countries’ views on climate change, nuclear power and their positions regarding the WTO are mostly aligned. Xi’s maiden visit fell short on encashing these synergies, but has left open the possibility of a tighter embrace in the near future. Ajit Ranade, based in Mumbai, India, is an economist with a large multinational company.